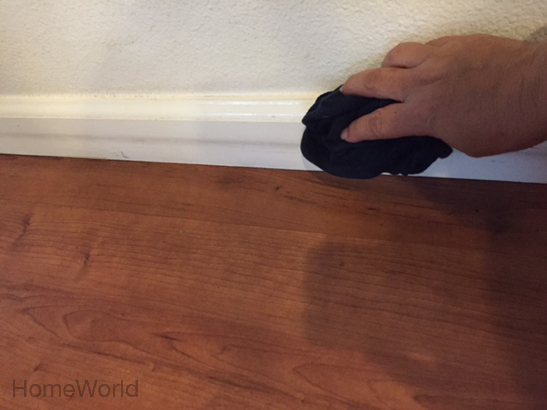 Quick Tip: How to clean your baseboards | Bringing together stories, rooms, life. 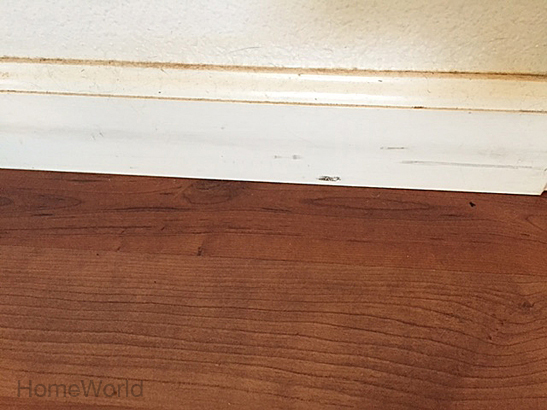 While researching this topic, I found out there are a lot of people who hate cleaning their baseboards. Maybe it’s because they have large homes or dislike cleaning in general. But for me, cleaning baseboards are no big deal. 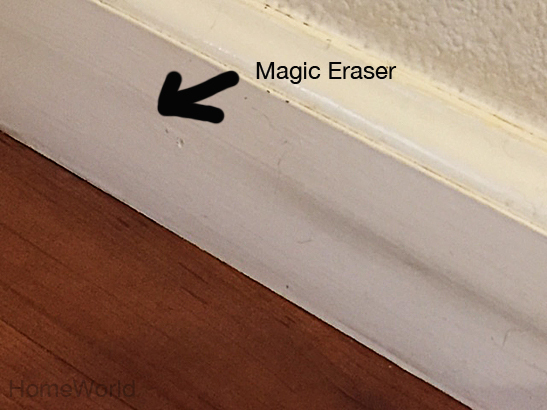 In my house, baseboards are cat fur magnets, so cleaning them is something I do every week. I usually just do the wipe-with-a-damp-cloth thing and move on. While reading other blogs, I picked up a few helpful hints I was eager to try. Whoa. 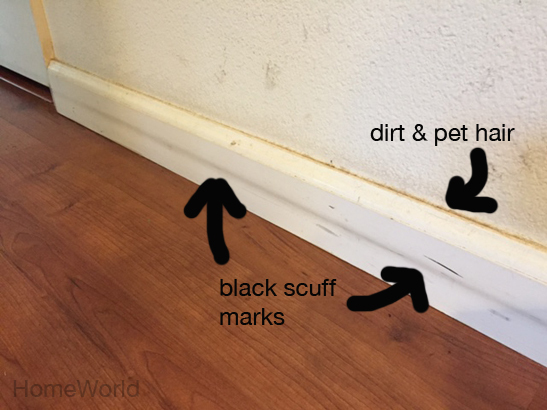 Maybe I need more advice on cleaning baseboards because this looks pretty bad. Honestly, I never noticed those black scuff marks before. Where did that come from? Also, the walls are looking pretty nasty too. First, remove all the loose dirt and pet hair with a damp cloth. I used an old t-shirt with a dab of dishwashing soap and water. 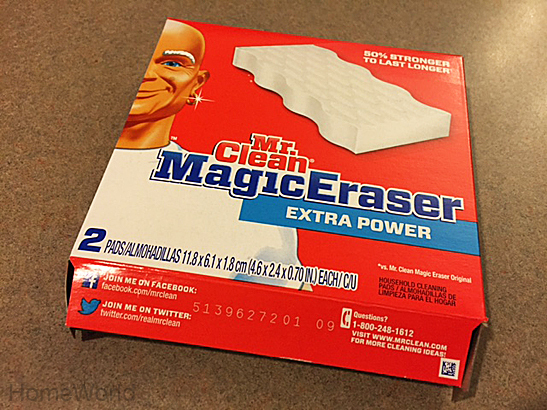 To remove those embarrassing scuff marks, I used Mr. Clean Magic Eraser. I cleaned the left side with Magic Eraser and shot this picture midway so you could see the difference. Oh my gosh! It’s like magic! Here’s what it looks like after a few swipes with Magic Eraser. Granted, it still needs a good paint job. But this will do for now. To keep it looking its best, give it a rub with a dryer sheet. This will repel dirt until the next cleaning. 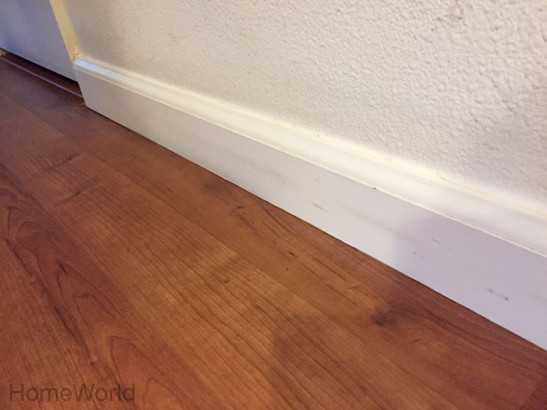 This entry was posted on September 11, 2015 by Terri Dux in Advice, Home care, Quick Tip and tagged baseboards, cleaning, dryer sheet, easy cleaning, HomeWorld Furniture, household quick tips, Mr. Clean Magic Eraser.